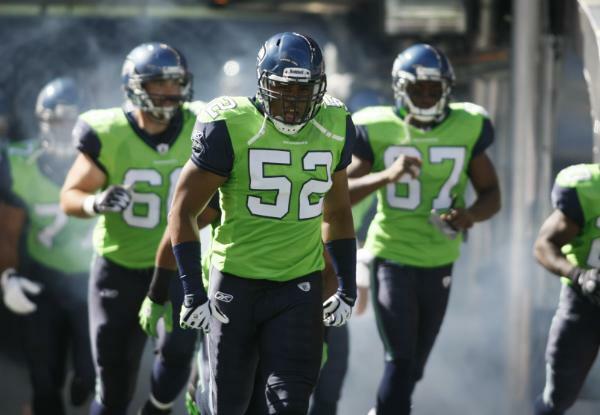 Anyone who has seen enough NFL games will notice that the venue of a matchup can influence the look of team's color palette, and therefore, uniforms. Is it a coincidence that the Chargers (alternate) and Dolphins jerseys have bright colors that seem well-suited to where they play? Or that many northern teams use a more traditional palette that features darker tones? As a Wisconsin native, I first noticed this trend with the Packers. 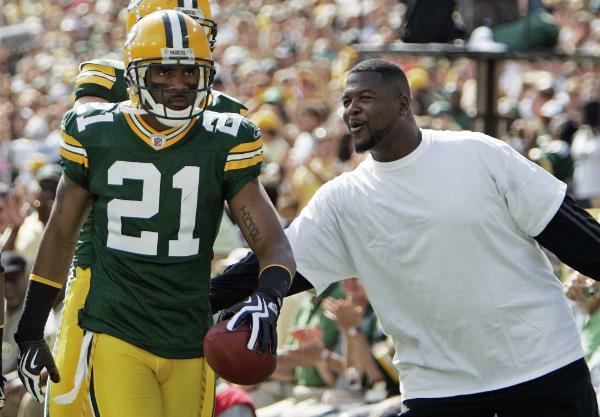 Early in the season, the Packers jerseys give off more of an emerald hue, while later in the season, the green appears less saturated and darker. There are multiple influences regarding this phenomenon. First, of course, is the fact that Wisconsin gets far less sunlight in November and December than it does in August and September. The second factor that influences color schemes is whether a team plays in a dome and the lighting that dome features. For as long as I have been watching football, I have never seen a dome as dimly lit as the Edward Jones dome in St. Louis. Just compare this photo of the Rams in Washington in Week 2 with this photo of the Rams hosting the Packers the very next week. 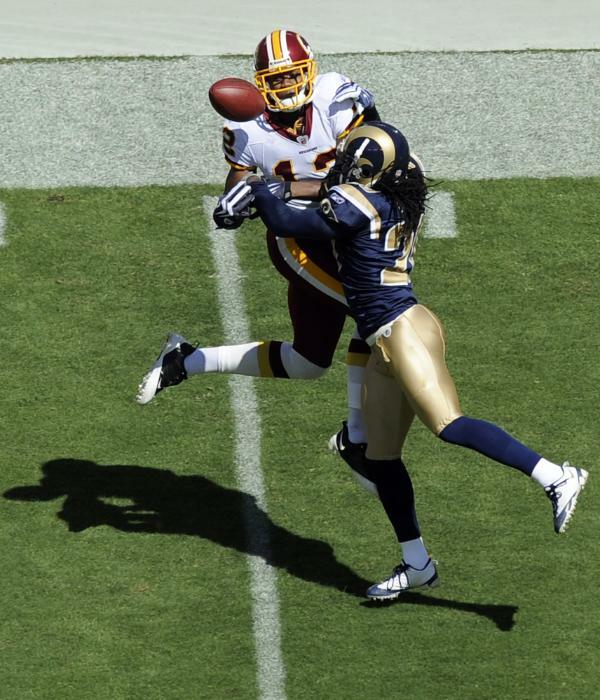 Why would the Rams want to wear such a color-less scheme eight games a year? Did they look at the colors in the dome before they released the current scheme? They almost look like the Saints when they don metallic gold with a blue that almost looks black. The Packers next opponent, the Seattle Seahawks, have a unique lighting situation. Their jerseys stay fairly consistent in various types of light, but the helmet changes color. On TV, the Seahawks main blue tends to come off a bit grey, which does not look as striking as the blue actually is in person. The color-changing phenomenon isn't nearly as noticeable on teams' white away jerseys. This is in part because the numbers on most jerseys are tackle twill, not mesh like the body of the jersey. The tackle twill tends to be more reflective on most teams uniforms. • Swapping the navy for a slightly blue-toned silver. 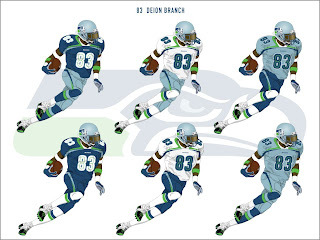 • A much more modern design with striping more comparable to the skunk-stripe in the seahawk's head. • An updated number font to correspond with the striping pattern. As a holiday treat for the fans/followers of this blog, I have decided to show off an extra design. I have generally been showing designs related to the Packers' schedule, but I felt this concept was too good not to show. The Washington… (drum roll)… Warthogs! Since the issue of the Redskins' name has been in and out of the Supreme Court this season, here is my attempt to salvage some of Washington D.C.'s football tradition, while moving away from what I believe is the worst name in sports. The name Warthogs is derived from the 'Skins fans who wear this. 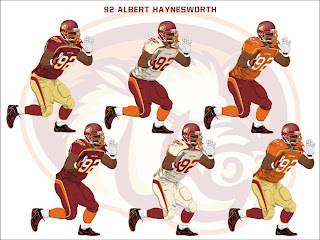 I also set out to feature the Redskins unique shade of burgundy, which is not used elsewhere in the NFL. The shading of the warthog head is stylistically carried through to the two-tone wordmark and jersey numbers. The home uniforms feature burgundy and metallic gold with orange accents, while the away jerseys are an off-white, similar to the San Francisco Giants' (MLB) home uniforms. The end result is a new chapter in Washington football that still addresses and cherishes the tradition of the past. 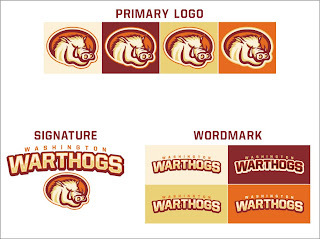 I'm not a Washington fan but I like the idea of the name change "Warthogs".